Are you looking for professional wood floor sanding in Allendale NJ? At Majestic Floors, our years of experience and dedication to customer satisfaction has left many floors updated, shining, and looking refreshed. With our dustless equipment, cleanup is minimized and you can begin enjoying your rejuvenated floors without delay! Our methods work great for homeowners looking to update their home for the holidays, and our prompt service creates beautiful hardwood floors in time for your guest's arrival. Hardwood floors are beautiful and elegant. They have a unique look that no other surface can hope to match. When done right, these floors are the perfect complement to the home. The perfect blend of natural bounty and human ingenuity. But when the floors begin to crack, split, tear, and wither away, they suddenly have the opposite effect. What was the perfect design element is not something you must hide with a large throw rug. You don’t have to replace the entire floor. Our affordable wood floor sanding in Allendale NJ removes these blemishes from your floor without installing, giving your home an update without breaking your bank. In our years of sanding hardwood floors, we’ve seen all types of jobs. We’ve seen floors so bad that we wondered what the homeowner did to get them to that state. We’ve seen cracks, tears, and leftovers for poor hardwood installations. The reason we say this is simple: no matter how bad your floor is today, it can be reborn tomorrow. And that’s exactly what we did for the other floors: brought them fresh life. Expert wood floor sanding in Allendale NJ is a fraction of the cost compared with a complete replacement. Still, we consider this a type of replacement. Why? Because we are replacing the feelings you have about the hardwood in your home. We will not only restore the floor to its previous glory, often times we make it look better than it did the first time. And then we’ll take preventative measures to ensure the floor lasts in this state for years to come. But the restaining process is only as good as the sanding. And we don’t say that simply as sanding experts. We make this claim as professionals who’ve seen the best and worst of floors. Think of it like this: would you paint your car if it had a massive gash running through the side of it? No, you’d get the gash taken care of first. And when we perform dustless wood floor sanding in Allendale NJ, we remove deep scratches. Let us show you how to breathe new life into your floor. For more information about wood floor sanding in Allendale NJ, call Majestic Floors today at (201) 739-1145. 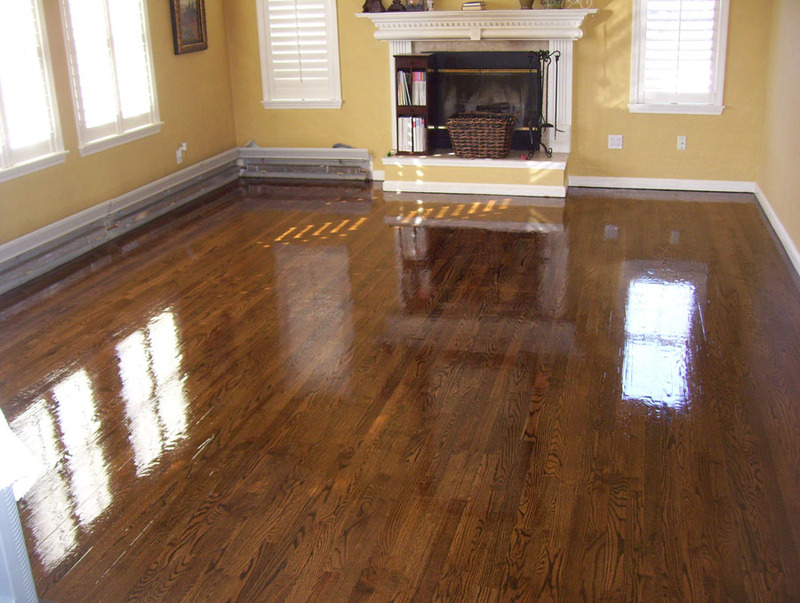 Are you looking to prepare your home for the holidays with wood floor sanding in Ramsey NJ? The wood floor professionals at Majestic Floors use our years of experience to rejuvenate your floor's appearance, and utilize our dustless equipment to clean up as we work! Your home will look wonderful for the season, leaving a shine that reflects light from windows and twinkling tree bulbs. With scuffs and cracks removed, your freshened floor will accent the hard work you put into cleaning your home for holiday guests. The holiday season is the perfect time for home renovations. There are more guests coming in and out of your home at this time than any other. Aside from this, there is extra money in the bank from holiday bonuses, or even Santa’s gifts. We also consider the winter season a time of purity and cleansing. For these reasons, we consider the winter the best time for professional wood floor sanding in Ramsey NJ. During the holidays, more people come in and out of your home than any other time of year. In fact, some family and friends may only come to visit during this time of year. For this reason, you should show these guests the best face of your home. When guests come this holiday season, let your home be praised almost as much as the season! There are good tidings aplenty when you choose our expert wood floor sanding in Ramsey NJ. And for all the right reasons. Let your hardwood floor send the right message: that your home is important, that your guests are important, and you take care to make it a welcoming space both emotionally and physically. Another great part of the holiday season are the bonuses we receive in the workforce. Some companies have special allowances for this gift-giving season, where other employers simply reward their workers for keeping the company afloat one more year. No matter the reason, you have extra money coming in. Our affordable wood floor sanding in Ramsey NJ keep money in your pocket. Our techniques create prompt results that will update your home in time for your guest's arrival. More than that, our commitment to your satisfaction means that we work with minimal interference with your daily routines, holiday shopping, or other preparations for celebrations. Poets and other artists have often linked the winter season to a time of death and decay. The truth is, what dies off in the winter is reborn in the spring. Winter is when nature hits the reset button and sets everything straight yet again to bloom and populate. Follow this trend. Consider that your floor was hibernating, and you want to reawaken it. Wood floor sanding in Ramsey NJ will get you on the right start to a glistening floor. For more information about how to transform your floor this holiday season with our dustless wood floor sanding in Ramsey NJ, call Majestic Floors today at (201) 739-1145. Issues can come up on your hardwood floor at any time. Some of these are because of faulty installation. Other issues come about by improper maintenance and care. The rest, of course, happen naturally as the floor boards wear with time. No matter the issue, a simple dustless wood floor sanding in Stony Point NY can bring you back to day one and allow you to re-craft the floor according to your ultimate vision. 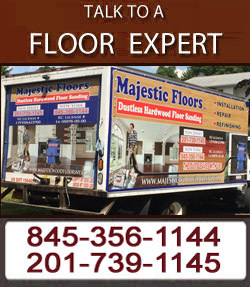 Majestic Floors has years of experience updating homes in Rockland County with wood floor sanding, giving them enhanced natural reflective lighting and a cleaner, refreshing look. Our professional wood floor technicians are knowledgeable in various types of wood, employing methods that leave each floor revitalized: the cracks, scuffs, and debris removed. With our dustless wood floor sanding, we are 99.9% efficient at capturing dust particles as tiny as .5 microns! This means little cleanup after we're done, you can begin enjoying your updated floor immediately! Because these issues may be unfamiliar to the common homeowner, we’ve arranged a list of three common problems below that may come up with hardwood floors. Not only do we explain the issue, but also how it comes about. Using the below information, you’ll be better equipped to care for your floor after the fresh dustless wood floor sanding in Stony Point NY we provide. Alligatoring is one common issue. No, this does not imply that an alligator got to your floor boards and cut them up with its jaws. This issue occurs when the finish begins to pull away from itself. The result is ridges and scales, similar to that of alligator skin. This occurrence to your hardwood floors is likely is the wetting of the finish was done improperly. It can also happen if the finish becomes contaminated or wears away because of cold temperatures. There are an assortment of reasons here, and most of them result from faulty installation conditions. Make sure you hire the professionals to alleviate this issue and smooth out your floor. Bubbles are a common issue we are called upon to fix. Bubbles in your hardwood floor means that soap or another contaminate got stuck somewhere within the finish. It could also happen if you apply cold finish to a hot floor, or hot finish to a cold floor. Air pressure can also cause these bubbles to form. Our professional dustless wood floor sanding in Stony Point NY can remove this effect of improper finishing, revitalizing your home. The most common issue to hardwood floors, however, remains discoloration. Most of the time, floor discoloration is naturally occurring due to natural wear and tear. Other times, the sunlight or oxidation causes the change in color. Either way, a quick sanding and refinishing job will set the floor straight and restore it to its brilliant color. Our dedicated service ensures that your floor is updated, fresh, and a centerpiece of your home once again. At Majestic Floors, we take pride in our services and our commitment to customer satisfaction. 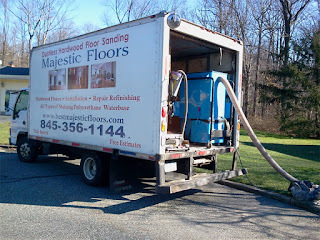 For more information about our dustless wood floor sanding in Stony Point NY, call Majestic Floors today at (845) 356-1144. Your floor is the only thing many people will see in your home. Although it is where they walk, it is also the most dominant feature of the house. If the floor is up to shape, then it will do well to support your design. If not, well, then the entire home will look worn down and rugged. At Majestic Floors, our dustless wood floor sanding in Allendale NJ can rejuvenate your wood floors, giving them a refreshing appearance that lightens rooms and creates a more welcoming atmosphere. With years of experience, our professional staff promptly enlivens your hardwood floor, leaving it without cracks, creases, scuffs, or debris. Hardwood floors can wear out in many ways. While most of the materials are meant to last several decades at least, this is only with regular maintenance and care. There are many ways the floor can take damage, even in the most careful home. The finish of your hardwood floor is prone to all sorts of damage. Alligatoring occurs when the finish begins to pull away from itself. This leaves the floor looking scaly, like that of an alligator skin. There is also applicator streaks that are marks visible even after the applicator dries. Your floor can experience a bleed back when the staining begins to seep up either onto the grain itself or into the space between the boards. All of these can be fixed with professional dustless wood floor sanding in Allendale NJ. The issues that sanding can solve are more than what is mentioned above. Other issues include bubbling, chipping, cratering, discoloration, peeling, and stains. There are times even when the finish looks old and worn out, even if it was freshly applied. The issue may be as simple as an uneven staining job across the floor. All of these occur naturally, at times, or via poor installation, but the problems are facilitated by improper care. If you care about your floor, it may be time to sand it down. By getting dustless wood floor sanding in Allendale NJ, you can remove any or all of these issues fairly quickly. You can restore your wood to its natural state and begin again. This time, you’ll take the proper steps to ensure your floor is up the standard it deserves. With professional dustless wood floor sanding in Allendale NJ, you can be sure that your floors will shine and be noticed by your guests this holiday season. At Majestic Floors, it is our core principle to leave your floors looking updated and beautiful, and leave you satisfied. For more information about dustless wood floor sanding in Allendale NJ, call Majestic Floors today at (845) 356-1144.